This year, Ex Fabula is excited to be joining The Great Thanksgiving Listen. #TheGreatListen2015 is an unofficial day of observance where Americans are encouraged to set aside time to record the stories of their families, friends, and local communities. It was first launched by the national oral history project StoryCorps in 2008 and now recurs on the Friday after Thanksgiving Day, when families are more likely to spend time together. It was proposed as an alternative to Black Friday. StoryCorps is working with teachers and high school students across the country on this project – but it’s open to everyone. Of course, you can make this experience your own. Do what works for you! Ignore the prompts and come up with your own questions. Maybe even skip the app and track down an old tape deck or super 8. The important thing is that you take time to listen. Afterward, please share you photos and comments about your experience on social media with the hashtag #ExFabListen15. This weekend, we’re sharing stories of hope. Both storytellers never give up hope for a better future as they fight the present and sometimes the past to get there. Heidi Wegleitner is an attorney working for Legal Action of Wisconsin. She works to keeps clients like Tracy, a single mother with a disability, from losing her housing assistance and her children. What she never expected was how having a child of her own would create an entirely different bond with the mothers she represents. Steve Wolski is a man living with Cerebral Palsy (CP) and is non-verbal. 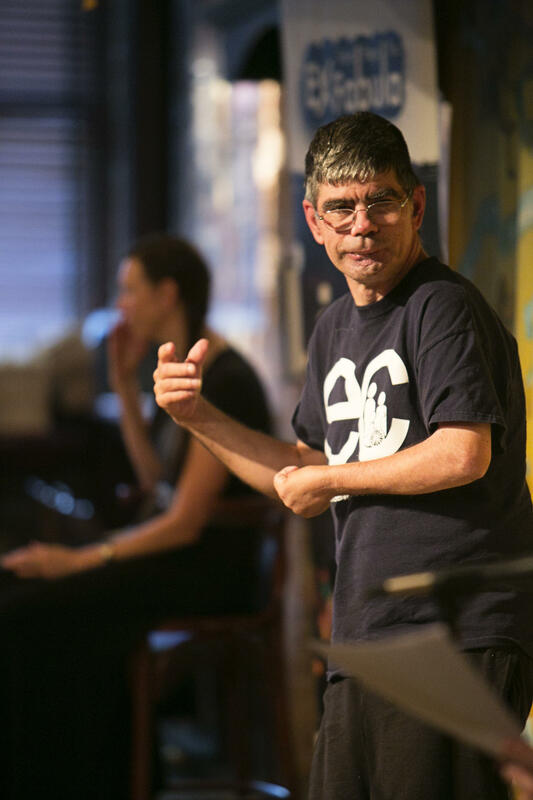 Last summer, he joined our StorySlam Easy Access: 25th Anniversary of the Americans with Disabilities Act. Steve shared his story, his struggle for independence and his struggle to communicate. He actually wrote his story and sat on the stage (front and center) while an Ex Fabula volunteer read from the background. Last weekend, Ex Fabula had a fantastic time at our first Secret Fabula of the season at Shaker’s Cigar Bar. The members—only event included small group tours of the building, the chance to mix and mingle during team trivia, and of course stories – about the afterlife, ghosts, and childhood romps in graveyards. So in honor of our Secret Fabula event, our radio show brings you stories of the supernatural. Do you believe? During season five, Ex Fabula launched the Secret Fabula, members-only storytelling events held at interesting and/or historic Milwaukee locations with patrons and staff serving as featured storytellers. Over the years Ex Fabula has truly evolved and we are very proud of the growth of our community programs and services, one of these being our membership program. Our membership program not only gives our members fantastic discounts and members-only events, but it provides Ex Fabula with the funding necessary to continue our mission to build our community through the art of true, personal storytelling. Thanks to everyone who attended Ex Fabula's October StorySlam at the Avalon Atmospheric Theater and Lounge. The theater was packed and we celebrated our second sold out show of the season; and this is just the beginning. Are you still nervous about taking to the stage? Join us on October 31st for our second Storytelling Workshop at Turner Hall.